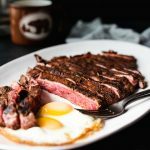 Grill up these Cardamom Coffee Rubbed Steaks and pair with fried eggs for an epic paleo breakfast. Heat one side of a gas grill to high. Rub the steaks in the spice rub. Set aside while the grill heats up to let the steaks come to room temperature. Oil the grates just before using. Place the steaks on the hot side of the grill. Grill for 2 minutes on each side, flipping only once. Transfer to the cool side of the grill, close the lid, and cook for 2-5 minutes depending on the thickness of the steak. Transfer the steaks to a plate or cutting board and let rest for at least 5 minutes before serving.